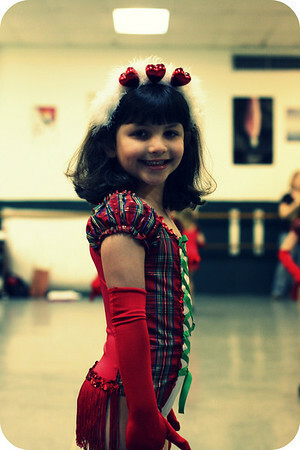 I had the best time earlier this week watching Annelise in her last dance class of the season. 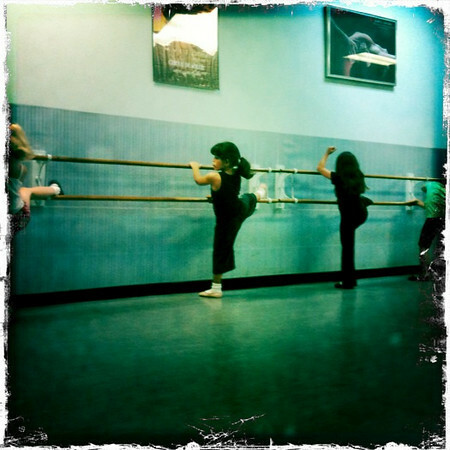 Her moments at the barre were somewhere between hilarious (think of the I Love Lucy Episode where she tried ballet) and occasional glimpses of grace and poise. We're looking forward to her recital this weekend down at The Grand Opera House in Galveston where she will shine for a few moments up on stage dancing a ballet number to "It's a Jolly Holiday with Mary" (from Mary Poppins). I love her wrinkly elephant ankles. she'll finish up with a jazz dance to "Move It" (from Madagascar). 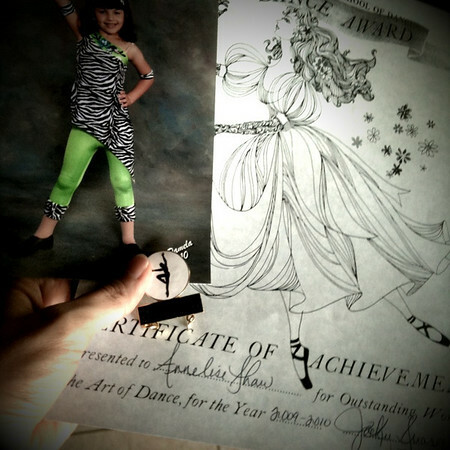 I didn't have a photo of her in her jazz outfit (mom fail), so I snapped a photo of her professional jazz photo along with her award certificate (she only missed once dance class this year) and her four year pin (each year she'll receive a bar--or charm, I'm not exactly clear on that--to add to her pin). ****Well, obviously the video link has been pulled. It was of the little girls dancing to Beyonce's Single Ladies at the World Dance Competition--maybe you've seen it? Yeah. She looks so cute, especially with the wrinkled ankles and little feet. These costumes bring back fun memories for me as a child. my daughter has been working on "Jolly Holiday" too…on the piano! and I am really glad they don't have routines like the video you posted! Oooooh! What a cutie. 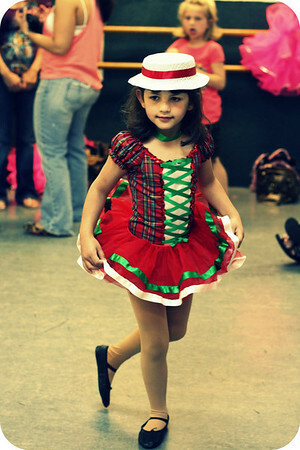 I loved dance recitals when I was little. Feeling slightly guilty that my daughter dropped ballet at age five. I KNOW!! Wasn't that video incredible!? The thing that got me most was the parents trying to justify it all. Unbelievable. I'm glad she is still in dance and I'm hoping she will want to continue for many more years. She likes jazz the best, but enjoys ballet and tap too. I'm also glad her studio is a tad old fashioned. They don't encourage the girls to *grow up* too soon with moves or costumes that are too mature for them. Even the older girls (high school) wear pretty modest costumes in the recital--which is refreshing. How great that your studio favors modest costumes! It's disturbing how so many studios dress little girls like hoochies. I bet Annelise did great! Hey, check out my blog, Blue Avenue!